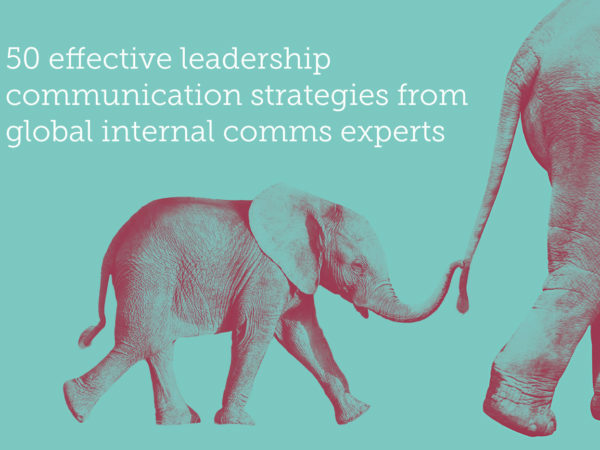 Last month, global leadership expert Jim Shaffer wrote a blog for H&H about the changing role of internal communication. 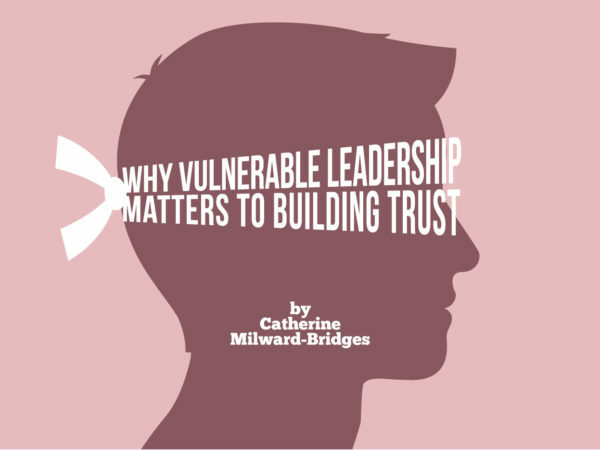 He explained that internal comms professionals increasingly need to focus on becoming ‘value creators’, and described employee engagement as ‘…the condition where employees share a common set of values and are willing to go above and beyond to help the organisation succeed’. To me, as an internal communications professional specialising in employee engagement, this is extremely accurate. Our function is about so much more than just communicating – it’s about inspiring, informing and most importantly engaging employees. 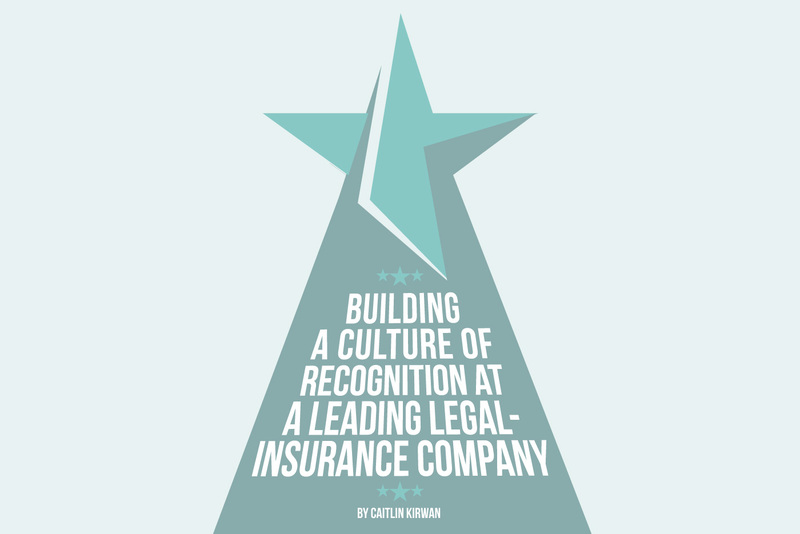 Recognition is widely recognised as one of the cornerstones of employee engagement. 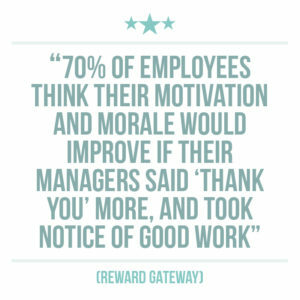 A 2017 study carried out by Reward Gateway showed that 70% of employees think their motivation and morale would improve if their managers said ‘thank you’ more, and took notice of good work. The study also revealed that nearly half would leave a company if they didn’t feel recognised, and that 59% would choose a business with a culture of recognition over a higher salary. Despite all of this, over a third of senior decision-makers don’t believe that regular recognition has an impact on retention. The results from DAS UK Group’s 2016 employee survey revealed that only 36% of our employees believed that we made good use of non-monetary rewards and recognition. This was a worrying statistic, highlighting that the vast majority of our people did not feel they were being recognised for their hard work. In response, we’ve taken a number of actions to address our recognition gap and help embed our company-wide RIGHT values – Respect, Improve, Go The Extra Mile, Honesty and Think Customer. Our first step was to launch an online employee-recognition platform, which we called RIGHT Here, RIGHT Now. The portal allows employees to submit an electronic ‘thank you’, aligned with one of our RIGHT values. The recognition is then displayed on the DAS UK ‘recognition wall’ for all employees to see, and add their comments and likes to. Our Employee Engagement Forum review all nominations every month and select our monthly RIGHT Values Champions, who are celebrated across the business. 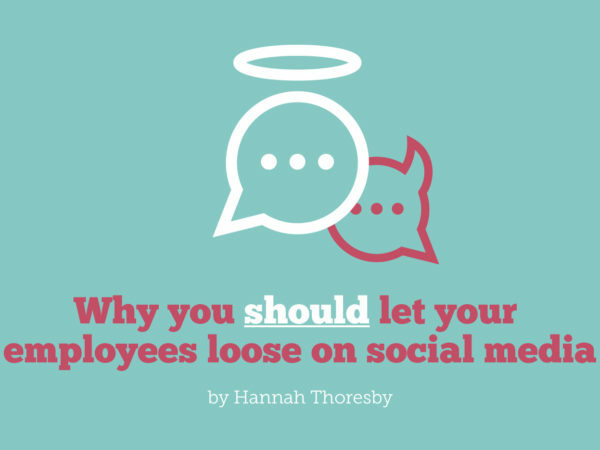 Internal communication has a big role to play in this. Throughout the development of the site, focus groups and workshops were held to ensure that employees could shape the new platform. There was a huge campaign around the introduction of RIGHT Here, RIGHT Now, which launched as part of values week in the summer of 2017. There’s no point in having a flashy recognition platform if it doesn’t get truly embedded into the business or become part of the daily language. 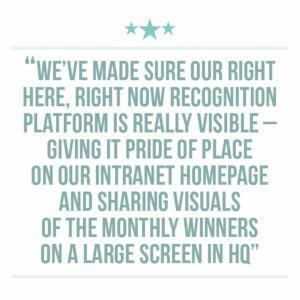 We’ve made sure that RIGHT Here, RIGHT Now is really visible – giving it pride of place on our intranet homepage and sharing visuals of the monthly winners on a large screen in the Head Office reception area. We also share updates and statistics about the portal with managers via our monthly management briefing document, to ensure the conversation is kept alive. Uptake has been fantastic so far, with around 90% of all employees actively engaging with the system. The next step of our recognition journey was a week-long campaign to mark RIGHT Here, RIGHT Now’s 1st birthday. Employee Appreciation Week was a multi-channel communications campaign to help boost our culture of recognition, and remind people that sometimes a simple ‘thank you’ can make all the difference. We circulated postcards for employees to complete and share with colleagues, created Special Thanks And Recognition (STAR) certificates for managers to award to team members, and published a series of employee Success Stories on our intranet and social media channels throughout the week. Engagement with the campaign was fantastic, with many teams creating ‘recognition boards’ where they stuck up all of the postcards and STAR Awards that had been received. We also used Employee Appreciation Week to announce our first annual RIGHT Values Champions Awards Ceremony, where we would crown the 2018 annual champions. The ceremony took place last month, and was a huge success! What does the future hold for recognition at DAS UK Group? Finally, it’s been critical to the project to have buy-in from our Executive Management Committee, who have thankfully been extremely supportive. 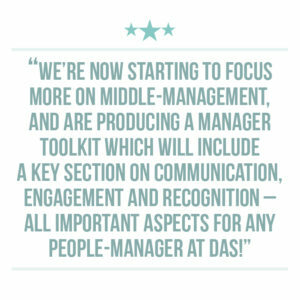 We’re also starting to focus more on middle-management, and are producing a Manager Toolkit which will include a key section on communication, engagement and recognition – all important aspects for any people-manager here at DAS. We’ve worked hard to start building our culture of recognition, and will be carrying out our next company-wide employee survey early next year. We’re still on our recognition journey, but are already seeing a shift in attitudes, and increased engagement. 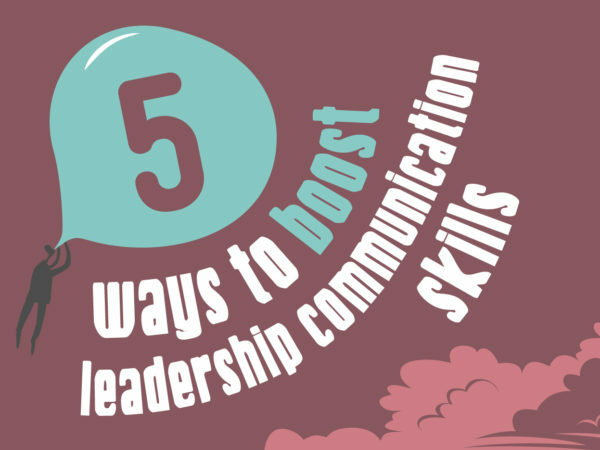 So far, it’s been a truly cross-functional collaborative effort, highlighting the need for internal communications professionals to broaden their horizons, and work hand-in-hand with Human Resources, Marketing, and senior managers. I’m an internal communications and employee engagement specialist based in Bristol. 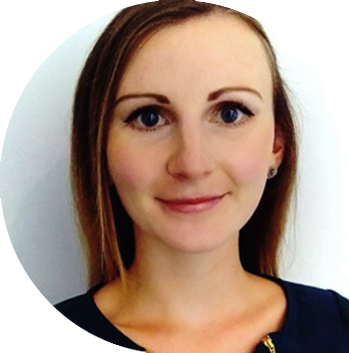 I currently look after all employee communication and engagement activity at DAS UK Group, and have previously managed internal communications for a range of companies across multiple sectors, tackling a variety of communication and engagement challenges. …check out our ‘Anatomy of an Engagement Employee’ Field Guide infographic to discover 30+ facts, stats and figures on exactly what makes an engaged employee tick!